Convert to .PDF & Print Anything! You can now easily select the documents, list items, Wiki pages, InfoPath web forms, SharePoint publishing pages and attachments , merge them into a .PDF file and print – all done in a single click! 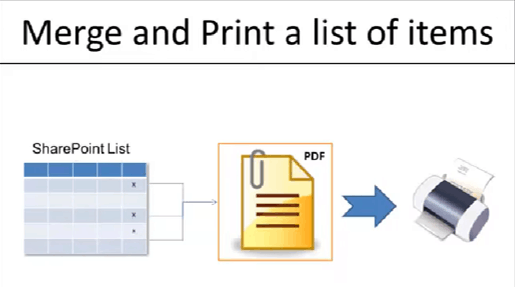 Many of us spend a lot of time manually creating documents that actually can be created automatically from list items. This is true for many types of information that should be managed as structured data (lists), rather than as documents, but still we need to publish them as documents. Such data items include leads, sales proposals, purchase orders, work orders and more.